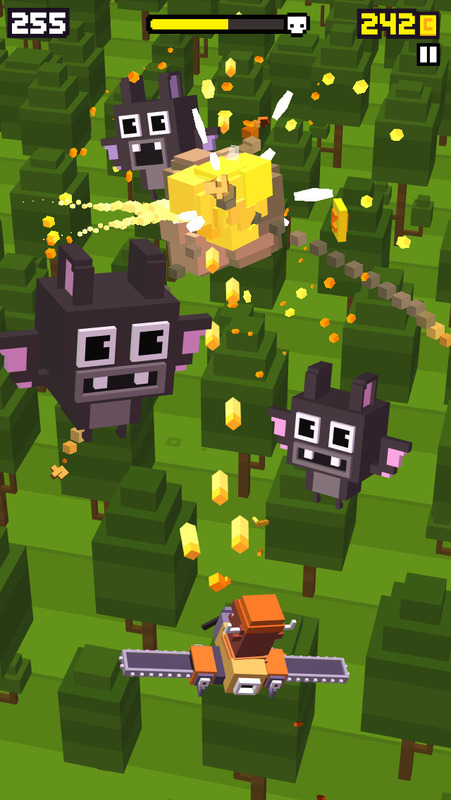 Shooty Skies (Free) is a chaotic, endless arcade shooter by some of the same people who created Crossy Road (Free). This follow-up to the viral hit uses the same quirky and cute style, featuring a variety of blocky animals and anthropomorphized electronics, but amps up the action one hundred fold. This arcade flyer puts the player behind the wheel of an aircraft loaded with pixel-shooting guns and drops them into a sky filled with a strange assortment of enemies that will barrage you with a variety of projectiles – joystick controllers, hamburgers, cans of soda, dollar bills, axes. There are 33 characters to choose from, all of which can be unlocked by random chance “draws” that can be bought for 500 in-game coins or can be unlocked via IAP for 99¢ each. Play as Shooty Cat, the feline pilot protagonist, Boombot the boombox, Snaps the camera, 3.1 the desktop computer, Crossy Chicken, Grumpy the (“King Kong”-like) gorilla, and many more. The significance of this variety is that each character comes with their own backdrop; so, Crossy Chicken will be soaring over the Crossy Road highways, Grumpy foregrounds a classic black-and-white cinema-style cityscape, 3.1 darts about a green-tinted computer motherboard, and C-1000 (an android version of Shooty Cat) flies through space. The changing environments don’t alter gameplay at all, but it is a cool detail that adds a bit of visual variety. The difficulty of the game comes from trying to balance shooting (holding the screen), weaving through barrages of enemies (sliding your finger across the screen), and blasting tough enemies with powered-up attacks (take your finger off the screen as long as you dare to power up). This is a fast-paced, busy arcade shooter that will do well with players that enjoy hectic visuals, frequent deaths, and many, many close calls. After a certain number of enemies are disposed of, a boss battle will commence—some of the cleverest moments of the game. Bosses include the likes of a money-spitting bald eagle, an axe-wielding giant beaver, and a disembodied mouth that fires fast-food. The bosses are witty and bizarre, and my favorite part of the game, by far. My only gripe is how the opt-in ads can mess with the flow of the game. Don’t get me wrong, there is a time and a place for advertisement trailers, especially in free-to-play games where the developer deserves some kind of a kickback. However, in a game that caters to fast, constant, busy gameplay, it can really slow down the intended pacing. Luckily, there are alternatives to ad-watching, namely paying in-game coins for frequent Continues and the occasional upgraded weapon. Some weapons can be unlocked for an hour by watching a single ad, which I was more than happy to do, since it was outside of actual gameplay, and others must be bought with in-game currency. Other than the standard guns, all weapons reset after an allotted time and must be re-purchased with ad-watching or coins. This was annoyingly redundant at times, but not in a game-breaking way. 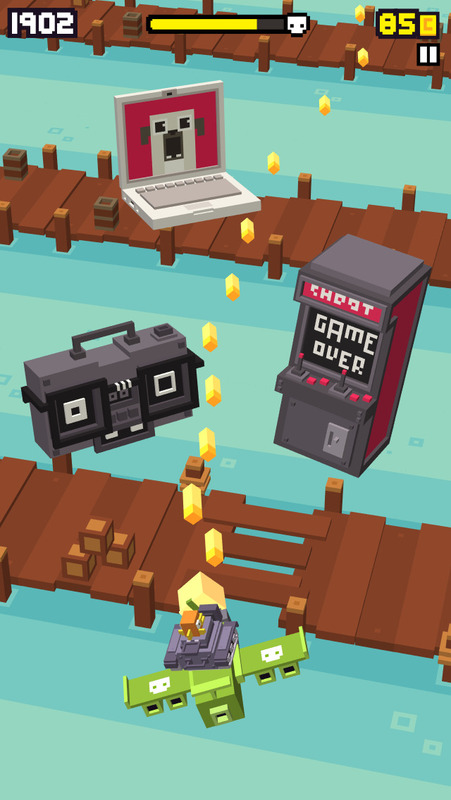 And for not so much of a gripe, more of a disappointed sigh: like its predecessor, Shooty Skies has no music. Crossy Road’s sound effects worked for that style of gameplay, though. The honks and whistles of traffic and trains was all that was needed to fill out the environment. But Shooty Skies mirrors the kind of arcade shoot ‘em up that wouldn’t be caught dead without a bouncy, up-tempo soundtrack. The patter of bullets, rattle of explosions, and occasional character cheer (Shooty Cat meows every so often, for example) just didn’t feel like enough—it was uncomfortably quiet, obviously lacking. This is a matter of opinion, though, and I’m sure there are many people that play with the sound off altogether, or those who don’t put as much weight on game soundtracks as I do. Overall, Shooty Skies is a fun, clever follow up to Crossy Road, a game that, surely, was hard to live up to. The crazy, endless flyer delivers an above-average experience, though not without a few prevalent flaws, and will appeal to Crossy fans and new players alike.